Particularly designed for the growing popular IP surveillance applications, PLANET FGSW-2624HPS / FGSW-2624HPS4 802.3at PoE web smart switch is a surveillance switch with the central management of remote power control and IP camera monitoring. The FGSW-2624HPS / FGSW-2624HPS4 provides PoE functions along with 24 10/100BASE-TX ports featuring 30-watt 802.3at PoE+ with RJ45 copper interfaces and 2 Gigabit TP/SFP combo interfaces supporting high-speed transmission of surveillance images and videos. With a total power budget of up to 220 watts and 420 watts for different kinds of PoE applications, respectively, the FGSW-2624HPS and FGSW-2624HPS4 provide a quick, safe and cost-effective Power over Ethernet network solution for small businesses and enterprises. To fulfill the needs of the high power consumption of PoE network applications, the FGSW-2624HPS / FGSW-2624HPS4 features the standard IEEE 802.3at Power over Ethernet Plus (PoE+) that combines up to 30 watts of power output and data per port over one cat5E/6 Ethernet cable. It is designed specifically to meet the demand of the high power consumption of network PDs (powered devices) such as IR, PTZ, speed dome cameras; and even box-type IP cameras with built-in fan and heater. Compliant with both 802.3at and 802.3af standards, the series allows more flexibility in power requirement for a variety of PDs, making installation costs affordable. The FGSW-2624HPS / FGSW-2624HPS4 helps users to monitor the current status of PoE power usage easily and efficiently with its advanced LED indication. Called “PoE Power Usage” found on the front panel of the FGSW-2624HPS / FGSW-2624HPS4 Fast Ethernet PoE+ Switch, it has four orange LEDs indicating the range of the current PoE power usage. The FGSW-2624HPS / FGSW-2624HPS4 can be programmed for advanced switch management functions such as dynamic port link aggregation (LACP), Spanning Tree Protocol (STP), IGMP Snooping v1, v2, bandwidth control and L2/L4 security control. The FGSW-2624HPS / FGSW-2624HPS4 provides IEEE 802.1Q tagged VLAN, port-based VLAN and MTU VLAN. The VLAN groups allowed will be maximally up to 32. 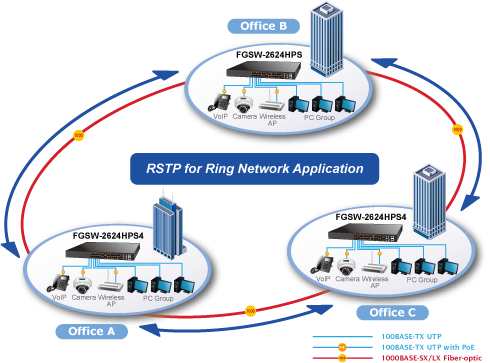 Via aggregation of supporting ports, the FGSW-2624HPS / FGSW-2624HPS4 allows the operation of a high-speed trunk combining multiple ports and supports fail-over as well. For catering to the need of easy management and centralized SNMP application to monitor the status of the switch and traffic per port, the FGSW-2624HPS / FGSW-2624HPS4 provides friendly Web management interface for efficient network operation. With its built-in Web-based management, the FGSW-2624HPS / FGSW-2624HPS4 offers an easy-to-use, platform-independent management and configuration facility. It also supports standard Simple Network Management Protocol (SNMP) and can be monitored via any standard-based management software. The FGSW-2624HPS / FGSW-2624HPS4 provides 2 extra Gigabit TP/SFP combo interfaces supporting 10/100/1000BASE-T RJ45 copper to connect with surveillance network devices such as NVR, Video Streaming Server or NAS to facilitate surveillance management. Or through these fiber SFP slots, it can also connect with the 1000BASE-SX/LX SFP (Small Form-factor Pluggable) fiber transceiver to uplink to backbone switch and monitoring center in long distance. The distance can be extended from 550m to 2km (multi-mode fiber), even going up to 10/20/30/40/50/70/120km (single-mode fiber or WDM fiber). They are well suited for applications within the enterprise data centers and distributions. 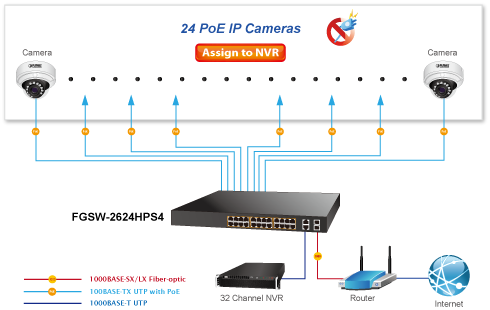 Providing 24 10/100BASE-TX PoE+ ports, in-line power interfaces and two Gigabit TP/SFP Combo interfaces, the FGSW-2624HPS4 can easily build an IP camera system for the enterprises where its power is centrally controlled. It can work with one 32-channel NVR to perform comprehensive security monitoring with 24 IP cameras via one Gigabit TP/SFP Combo port. The FGSW-2624HPS4 comes with non-blocking design, desktop size and SFP fiber-optic modules, bringing flexibility to building a network infrastructure at a low cost. 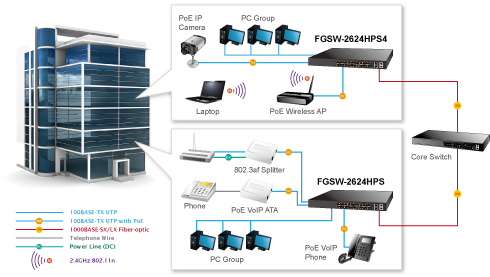 Providing 24 10/100BASE-TX PoE+ ports, in-line power interfaces and two Gigabit TP/SFP Combo interfaces, the FGSW-2624HPS can easily build a VoIP system for the enterprises where its power is centrally controlled. 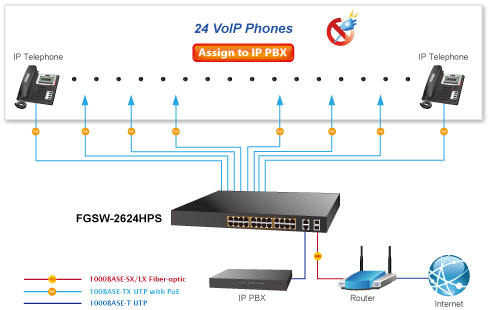 It can work with one IP PBX to perform comprehensive security communicating with 24 VoIP phones via one Gigabit TP/SFP Combo port. The FGSW-2624HPS / FGSW-2624HPS4 features strong rapid self-recovery capability to prevent interruptions and external intrusions. It incorporates Rapid Spanning Tree Protocol (802.1w RSTP) into customer’s automation network to enhance system reliability and uptime.